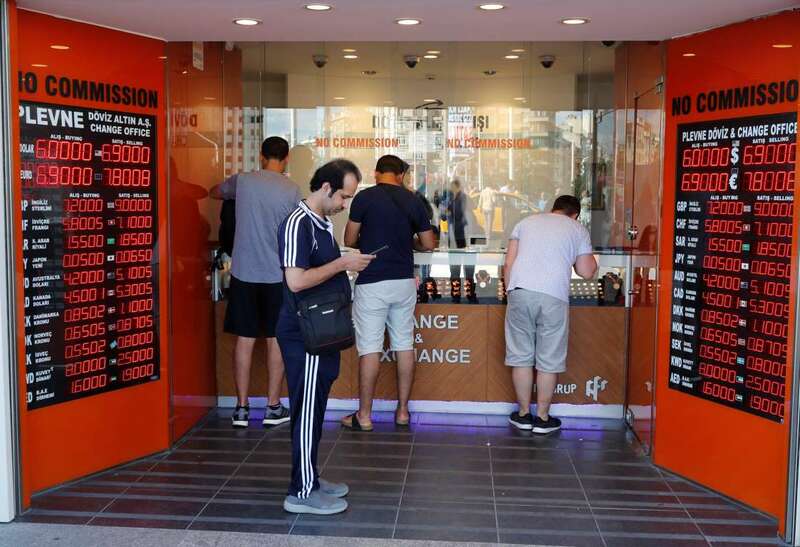 A currency exchange office in Istanbul, Turkey, on Monday. President Recep Tayyip Erdogan has long made clear that he considered no part of Turkish life beyond his reach, not least the economy. Even before he was re-elected in June with sultan-like powers , he had built his popularity on sustained economic growth fueled by signature megaprojects — the latest being plans for a canal bisecting the country. But critics have long charged that much of that expansion was built on budgetary sleight of hand, cronyism and corruption. Now Turkey’s worst economic crisis since 2001 — the currency hit another new low on Monday — has confronted Mr. Erdogan with the limits of his authoritarian approach and could end his long run of success. It is also fanning fears of a global contagion , as Turkey’s troubles undermine investor confidence in other emerging market economies and raise concerns about the exposure of banks even in developed regions, like the European Union. Turkey’s economic troubles, analysts say, are largely of Mr. Erdogan’s own making. They have less to do with his dispute with the United States and the prospect of greater sanctions than with Mr. Erdogan’s deepening economic interference as he attempts to bend the logic of monetary policy and global financial markets to suit his political purposes. [post_ads]Yet while Mr. Erdogan asserts greater control over life in Turkey — including the media, the judiciary, foreign policy and political decision-making — it is far less clear that he can bully an economy increasingly beholden to global markets to submit to his will, they say. Business leaders warn that the many strands of the president’s authoritarian approach are intertwined, and that Turkey will not climb out of its hole until the country enacts major structural reforms that would undo many of Mr. Erdogan’s constraints. Those would include allowing a free press, an independent judiciary and returning powers to Parliament. Another step, the release of political prisoners, would help repair relations with Europe. While Mr. Erdogan could still change course, whether he will is far from certain. In the meantime, the levers available to him will not avert the economic pain that is now inevitable, they say. Many analysts say that, as he has accumulated power, Mr. Erdogan has become increasingly isolated, surrounding himself with advisers who reinforce his own views, while sidelining real expertise. In particular, Mr. Erdogan has insisted on following a policy of keeping interest rates low to allow a huge program of fiscal stimulus based around the construction industry to generate high growth. 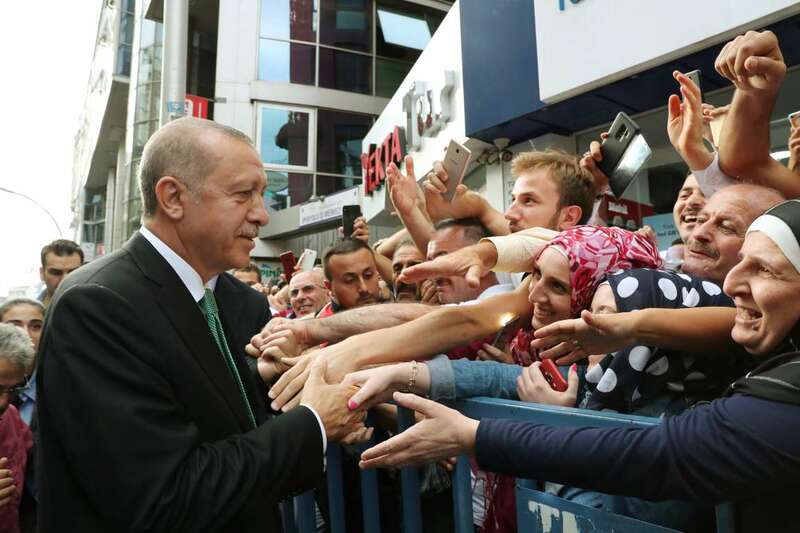 President Recep Tayyip Erdogan of Turkey with supporters in the Black Sea city of Trabzon, on Sunday. In May, in an interview with Bloomberg TV, Mr. Erdogan explained why he wanted more control over the central bank and interest-rate policy. “When the people fall into difficulties because of monetary policies, who are they going to hold accountable?” he asked. “Since they’ll ask the president about it, we have to give off the image of a president who is influential on monetary policies,” he added. Yet most economists argue that the policy is no longer tenable and that the economy is already in recession amid mounting foreign debts and a current account deficit. Keeping interest rates low is driving up inflation, which is hurting people’s pocketbooks. For months credit-rating agencies and investment specialists have been signaling that the political management of Turkey’s economy is scaring away investment. Turkey has weathered financial storms before thanks to its size and diversity, but the outcome will depend on the “coherence and predictability of the policies that are pursued,” the credit-rating agency Moody’s advised in a statement in June. In July, after Mr. Erdogan’s re-election, and after he appointed his son-in-law Berat Albayrak to the newly combined position of treasury and finance minister, Moody’s announced another downgrading of Turkey’s credit rating. “Any perception of encroachment into the independence of the central bank and other public institutions will likely exacerbate investor concerns,” it wrote in a statement. Since the election, Mr. Erdogan has passed a flurry of decrees bringing the system of government under the president’s control. The changes center power increasingly in Mr. Erdogan’s hands, allowing him to appoint senior officials in almost every area of life. Far beyond the central bank, analysts warn, the changes represent a creeping politicization of the state. Among the changes is the elimination of senior Civil Service positions in the powerful Turkish bureaucracy. Turkey has always had a strong bureaucracy, modeled on the French system, with a senior bureaucrat, called an under secretary, in every ministry, assisted by deputy under secretaries. Those positions have been eliminated and the civil servant positions replaced with deputy ministers appointed by Mr. Erdogan. Any positive gain from bringing outsiders into the administration has been tempered by the polarizing nature of Mr. Erdogan’s rule, which has increasingly pushed out people who are seen as ideologically or politically opposed to his Justice and Development Party, and favored party loyalists. Yet relying on the party for appointees excludes a vast pool of talent, something that has also been evident with the purges of 150,000 public employees since the failed coup of 2016. The appointment of Mr. Albayrak to the post of treasury and finance minister has been taken as a signal not only of Mr. Erdogan’s determination to control monetary and fiscal policy, but also of his intention to prepare a dynasty. In 2004 he married Esra, Mr. Erdogan’s eldest daughter, who studied at the University of California at Berkeley, and two years later they returned to Turkey. [post_ads]Mr. Albayrak entered politics in 2015, becoming a member of Parliament, and later that year was appointed energy minister. He was appointed treasury and finance minister to the new cabinet after the June 24 elections. Even as the business world regretted the departure of more experienced officials from the government, some hoped that Mr. Albayrak, being a relative, might be able to persuade Mr. Erdogan to moderate his insistence on keeping interest rates low. But so far Mr. Albayrak has not done enough to stem the damage, Mr. Yesilada said. At a news briefing Friday, Mr. Albayrak gave assurances of the independence of the Central Bank, yet that the fact that the bank failed to act to shore up the lira showed it was either not independent, or amiss at its job, he said. “No Central Bank would stand by while its currency is depreciating,” he said. Ankara kept asking for other options to the crisis, he said, but he predicted that Mr. Erdogan would have no option in the end. “He will wake up and smell the coffee,” he said.